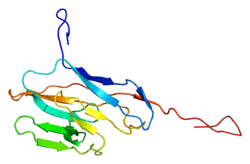 Carcinoembryonic antigen-related cell adhesion molecule 8 (CEACAM8) also known as CD66b (Cluster of Differentiation 66b), is a human gene. Its main function is cell adhesion, cell migration, and pathogen binding. Khan WN, Frängsmyr L, Teglund S, et al. (1992). "Identification of three new genes and estimation of the size of the carcinoembryonic antigen family.". Genomics. 14 (2): 384–90. doi:10.1016/S0888-7543(05)80230-7. PMID 1427854. Oikawa S, Inuzuka C, Kuroki M, et al. (1991). "A specific heterotypic cell adhesion activity between members of carcinoembryonic antigen family, W272 and NCA, is mediated by N-domains.". J. Biol. Chem. 266 (13): 7995–8001. PMID 2022629. Berling B, Kolbinger F, Grunert F, et al. (1990). "Cloning of a carcinoembryonic antigen gene family member expressed in leukocytes of chronic myeloid leukemia patients and bone marrow.". Cancer Res. 50 (20): 6534–9. PMID 2208113. Arakawa F, Kuroki M, Misumi Y, et al. (1990). "Characterization of a cDNA clone encoding a new species of the nonspecific cross-reacting antigen (NCA), a member of the CEA gene family.". Biochem. Biophys. Res. Commun. 166 (3): 1063–71. doi:10.1016/0006-291X(90)90975-S. PMID 2306228. Eades-Perner AM, Thompson J, van der Putten H, Zimmermann W (1998). "Mice transgenic for the human CGM6 gene express its product, the granulocyte marker CD66b, exclusively in granulocytes.". Blood. 91 (2): 663–72. PMID 9427723. Torsteinsdóttir I, Arvidson NG, Hällgren R, Håkansson L (1999). "Enhanced expression of integrins and CD66b on peripheral blood neutrophils and eosinophils in patients with rheumatoid arthritis, and the effect of glucocorticoids.". Scand. J. Immunol. 50 (4): 433–9. doi:10.1046/j.1365-3083.1999.00602.x. PMID 10520185. Oikawa S, Sugiyama M, Kuroki M, et al. (2001). "Extracellular N-domain alone can mediate specific heterophilic adhesion between members of the carcinoembryonic antigen family, CEACAM6 and CEACAM8.". Biochem. Biophys. Res. Commun. 278 (3): 564–8. doi:10.1006/bbrc.2000.3858. PMID 11095950. Singer BB, Scheffrahn I, Heymann R, et al. (2002). "Carcinoembryonic antigen-related cell adhesion molecule 1 expression and signaling in human, mouse, and rat leukocytes: evidence for replacement of the short cytoplasmic domain isoform by glycosylphosphatidylinositol-linked proteins in human leukocytes.". J. Immunol. 168 (10): 5139–46. doi:10.4049/jimmunol.168.10.5139. PMID 11994468. Zhao L, Xu S, Peterson C, et al. (2002). "Purification and characterization of a 95-kDa protein--carcinoembryonic antigen-related cell adhesion molecule 8--from normal human granulocytes.". J. Immunol. Methods. 270 (1): 27–35. doi:10.1016/s0022-1759(02)00215-6. PMID 12379336. Ramachandran P, Boontheung P, Xie Y, et al. (2006). "Identification of N-linked glycoproteins in human saliva by glycoprotein capture and mass spectrometry.". J. Proteome Res. 5 (6): 1493–503. doi:10.1021/pr050492k. PMID 16740002.